“In February 1912 the Italian Futurists presented Les peintres futuristes italiens, their first international exhibition in Paris, at the Galerie Bernheim-Jeune. This event is regarded by scholars as a lynchpin moment for the movement and even the historic avant-garde as a whole. 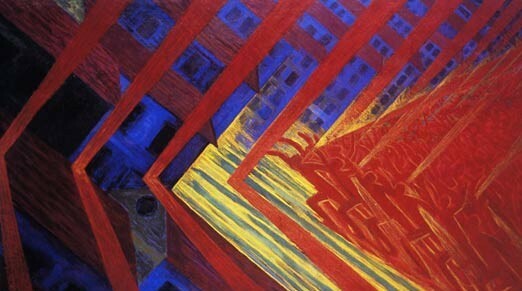 Modern literature on this period of Futurism presents the show as the culmination of a full-movement stylistic shift from Italian Divisionism to Cubism, largely under the guidance of Umberto Boccioni. Scholars have continuously presented Boccioni as the leader of Futurist painting, and his oeuvre is often discussed as the most iconic visual interpretation of the tenets of Futurism. This study serves as an alternate reading of early Futurist painting. 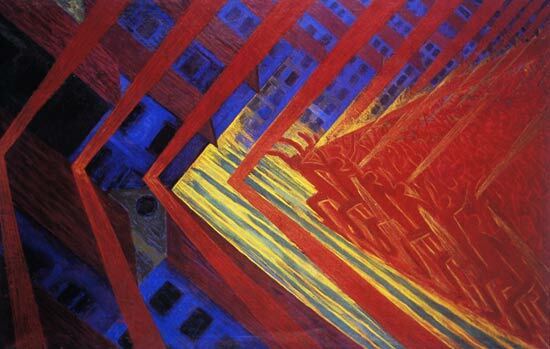 Using three of the five founding Futurist painters as case studies I argue against traditional scholarship’s appraisal of both the exhibition at the Bernheim-Jeune and Umberto Boccioni. Although I recognize that the exhibition marks a major turning p oint for the movement, I do not support the notion that it was the culmination of a total shift from Divisionism to Cubism. Boccioni’s Futurism was neither the only vision of Futurist painting developed during this period, nor was it the only version presented at the Bernheim-Jeune. In this thesis I contend that the 1912 show at the Bernheim-Jeune was the occasion for a great moment of diversity and multiplicity within Italian Futurism and that each of the five Futurist painters presented independent artistic visions.